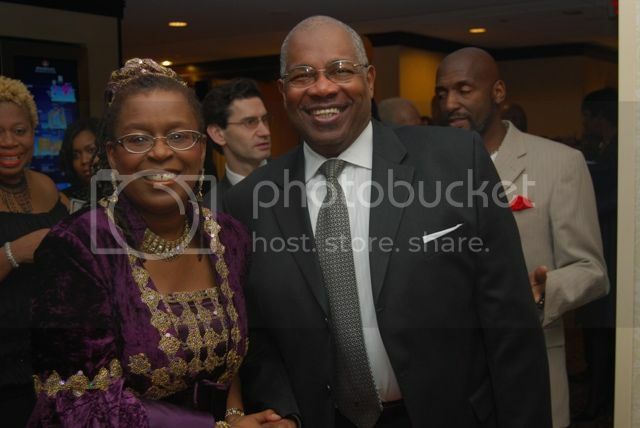 Dr. Claire Nelson, Founder and President of Institute of Caribbean Studies and Arnold Jackson, Associate Director, Decennial Census at the 16th Anniversary of the Caribbean American Heritage Awards, November 13, 2009 in Washington, DC. The Caribbean American Heritage (CARAH) Awards held its 16th anniversary on Friday, November 13, 2010 at the Renaissance Marriott Hotel in Washington, D.C. celebrating and highlighting people from the Caribbean and the gains they have made in the United States. The annual gala, which is a flagship event of the Institute of Caribbean Studies (ICS), celebrates the contributions, legacies and future of those of Caribbean heritage. I'd like to thank Global Hue, one of the gala sponsors for inviting me as a guest at their table! ICS Honorees span the range of sectors from health, to education to housing development and include Earl Graves, CEO and Publisher of Black Enterprise who is of Barbadian heritage, and actress Cicely Tyson, who is of Nevisian heritage. The Gala has also honored Friends of the Caribbean such as former Congressman Kweisi Mfume, and Congresswoman Barbara Lee. Special guests of the evening included Michael Blake, Associate Director in the White House Office of Public Engagement & Deputy Associate Director of the Office of Intergovernmental Affairs, and Maureen Bunyan, anchor for ABC-7 in Washington, DC. This year, ICS used the GALA as an opportunity to kick into high gear its Count Us Caribbean Campaign, which ICS Founder and President Dr. Claire Nelson leads as Chair of the National Caribbean American Complete Count Committee. Arnold Jackson, Associate Director for Decennial Census of the Census 2010, attended and brought Special Remarks on the 2010 Census. In an effort to maximize the number of participants, the Census is concentrating on hard-to-count audiences and has reached out to several key people in diverse communities to help spread the word about the importance of the Census. Dr. Claire Nelson, a Jamaican, was selected as a National Profile Partner of the Census and is developing outreach strategies to target the Caribbean communities. The 2009 Honorees are: Willard Wigan, M.B.E, Micro Sculptor; George Willie, C.P.A., Managing Partner,Bert Smith & Co.; Hon. Shirley Nathan Pulliam, Member, Maryland House Of Delegates; Lynton Scotland, Vice President Operational Excellence, Nrg Energy Inc.; Alison Hinds, Soca Diva & Performing Artiste; Dr. Anthony Kalloo, Natural Orifice Surgery Pioneer & Chief Of Gastroenterology & Hepatology at Johns Hopkins; and Hon. Usain Bolt, Elite Athlete.